The State Commissioner for Transportation, Mr. Ladi Lawanson, who disclosed this on Thursday at the Secretariat, Alausa, noted that the deployment of the new buses will address the inadequacies of the present unreliable transportation system in Lagos metropolis. The fire stricken Italian ship, MV Grande America, owned by the Grimaldi Group, has sunk in the Bay of Biscay in water depths of 4,600 meters off the coast of France. Fire broke out on the Grande America on Sunday night as the ship was underway in the Bay of Biscay during a voyage from Hamburg, Germany to Casablanca, Morocco. The fire was primarily located in cargo containers in the forward portion of the ship. Several containers fell off the ship into the water while it was burning before it eventually sank on Tuesday afternoon. All 27 crew members abandoned ship in a lifeboat and later rescued by British frigate HMS Argyll and were taken ashore to the French port of Brest. No major injuries were reported, although several of the crew members were treated for smoke inhalation. Occupants of a building in the Oke Arin part of Lagos Island are currently trapped following the collapse of a house at Egerton Square. A resident said that the incident happened at around 3.30pm on Monday. Eyewitness said the building located at No 57, Egerton square in Alakoro area, Lagos Island, collapsed just as Lagos State Building Control officials were demolishing a building beside it. The affected building itself was earmarked for demolition. It was gathered that many people are still trapped in the rubble as rescue mission by residents and sympathizers is underway. The Lagos state government has commenced the demolition of buildings likely to collapse at Lagos Island. Government officials are currently pulling down such houses on Freeman street in Ita Faji area. The development comes two days after a three-storey building on Massey street in the same area, caved in. Twenty people, including nine children were killed in the incident while 50 were rescued. The candidate of All Progressives Congress in Lagos State, Babajide Sanwo-Olu, has been declared the winner of the governorship election held on Saturday, March 9. Returning Officer, Prof. Eyitope Ogunbodede, made the declaration on Sunday at INEC’s collation centre in Yaba, Lagos. Following the announcement of the results of all the local government areas in Lagos State, the All Progressives Congress has won in all the LGAs. Meanwhile, there was a mild drama at the collation centre when the governorship candidate of the Labour Party, Prof. Ifagbemi Awamaridi, protested against the announcement of the results. He argued that the election in the state should not have taken place at all given that the number of electoral materials were incomplete, as discovered during the distribution in the premises of the Central Bank of Nigeria branch in the state on Wednesday. Awamaridi, whose insistence drew comments from the audience, said, “On Wednesday, we pointed out that the election materials were not complete and the law says election should not start until that is resolved. Bola Tinubu, a national leader of the All Progressives Congress (APC), says “O to ge”, the slogan used to dislodge Senate President Bukola Saraki is not applicable in Lagos. Loosely translated as “enough is enough”, the slogan yielded massive rewards for Kwara APC as the party displaced all the three sitting senators in the state, won all house of reps seats and President Muhammadu Buhari defeated Atiku Abubakar, presidential candidate of the Peoples Democratic (PDP), with over 150,000 votes in the state. Some politicians and activists opposed to Tinubu had attempted to use a similar strategy to stop the emergence of Babajide Sanwo-Olu, his preferred candidate. But fielding questions from reporters after casting his ballot at polling unit 047, ward 3, Ikeja local government area of the state, Tinubu said in Lagos, the people should consider “o to pe”, translated as “it’s worthy of praise”. He said there is a limit to copying concepts from other states, expressing confidence that his party would emerge victorious in the exercise. “The O to ge slogan is for Ilorin; Lagos is not Kwara state, and there is a limit to copying. Lagos should be O to pe, not O Toge,” he said. “We are going to win because we are the only party in Lagos state, others are pretenders; they come and they will go away. Leopard cannot change his skin. “Lagos belongs to the progressives; we are progressives and we will remain progressives. For Lagos, it has seen tremendous development since I was the governor; before then, the highest internally generated revenue (IGR) was N600 million, per month, now it is over N30 billion. “No other state has achieved what we have achieved, financial independence, as Lagos state; no other nation, they all depend on allocation from the federal government. Lagos State today will not depend on any allocation before we take care of capital needs; we build roads and bridges everywhere from Oregun to many parts of the state. Tinubu said the the violence which erupted in the Okota area of state during the presidential and national assembly elections, is not enough to give the impression that the state is prone to violence. He blamed the media of giving hype to negative stories, saying that such attributes would not bring the necessary progress. “I take exception to what happened in Okota two weeks ago. I am very upset about that incidence placing Lagos as if we are violent-prone,” he said. “We have about 1,325 polling units in Lagos State and only five units were affected in Okota. That should not mean that the election was a failure in the state. “If we should rate it, the election should be about 97 per cent rate of success if right mentally. An incident in Okota should not be used to generalise the whole election in Lagos State. “The success rate should have been the story, not the ugly incident that should be the story. For the media, how can five units out of 1,325 units constitute a violent election and were given hype that Lagos is violent; we cannot do justice to that. “How can we have development to the economy and the medium of information? In terms of security, Lagos has always been ready to celebrate democracy, and violence free. The security officials are doing well and the INEC has started well too with the logistics well managed. The Lagos State Government says there is no public holiday on Friday, March 8, advising all civil servants to be at their various duty posts. Commissioner for Information and Strategy, Mr Kehinde Bamigbetan, made the disclosure in a statement in Lagos. Bamigbetan decried reports currently circulating on social media platforms suggesting that Governor Akinwunmi Ambode had declared Friday as public holiday to enable residents prepare for the March 9 Governorship and House of Assembly elections. He restated that all public and private schools in the state were expected to proceed on the second mid-term break on Thursday 7 and Friday 8 March, as earlier announced by the Deputy Governor, Dr Idiat Adebule. According to him, all public and private schools will resume academic activities on Monday, March 11, in accordance with the revised school calendar for the 2018/2019 academic year. Governor Akinwunmi Ambode of Lagos State has denied suggestions that he is working with agents of Peoples Democratic Party presidential candidate, Atiku Abubakar ahead of the March 9 gubernatorial elections. Ambode is a statement issued by his spokesman, Habib Aruna, strongly debunked the accusations contained in a story carried by The Nation newspaper in its March 1 edition. The governor insisted that he remained a commited member of the ruling All Progressives Congress, which is the choice of Parisians. The attention of the Lagos State Governor, Mr. Akinwunmi Ambode, has been drawn to a report in today’s edition of The Nation newspaper, Friday March 1, 2019. Specifically, the contentious report, which was published on the newspaper’s front page without any by-line, insinuated that Governor Ambode might be working with an opposition party through a former member of the Lagos State Executive Council and Commissioner for Energy & Mineral Resources, Mr. Wale Oluwo. The report also attempted to hold the Governor responsible for the alleged activities of Senator Tokunbo Afikuyomi because he supported the governor’s gubernatorial ambition during the primaries of the All Progressives Congress in October 2018. The governor wishes to make it abundantly clear that, having declared publicly his acceptance of the decision of the party on the primaries, he has not and will never take any action to undermine the prospects of the party in the on-going elections. It is human to aspire and the capacity of each individual to manage the negative outcomes of a legitimate aspiration differs. But that should never be the basis to link His Excellency to whatever action of certain individuals who might have shared his vision in the past but have proceeded to pursue their own interests as adults and citizens without any influence from or recourse to the governor. Governor Ambode’s decision to stand by the party that has given him the platform to serve Lagosians meritoriously is based on the principle of justice, responsibility and loyalty. He has everything to gain from the victory of the party’s candidate Mr. Babajide Sanwo-Olu as the Governor of Lagos State on March 9, 2019 and he looks forward to handing over the affairs of the state to the candidate of the APC come May 29th. It is therefore disturbing, unfair and sad that a respected medium such as The Nation which enjoys the goodwill of members of our party and is appropriately positioned to verify the falsehood of these fictitious and sponsored hatchet job chose not to observe the journalistic dictum of “if in doubt, leave out” in the breach. In this circumstance, His Excellency hereby makes use of his right to a rejoinder and demands an apology for the unjustifiable aspersions cast on his person by wrongly presenting him to right thinking members of the public as a disloyal saboteur trying to frustrate his party’s campaign and electoral victory. Governor Ambode has consistently appealed to those who sympathize with him that the best way to express solidarity is to vote for the candidates of the All Progressives Congress on Saturday March 9, 2019 in order to ensure that his own legacy is preserved and the gains of the past four years are improved upon. As we move towards next Saturday’s important election, Governor Ambode urges Lagosians and party faithful not to allow fifth columnists pretending to be overzealous crusaders frustrate our onerous efforts to take Lagos State to the next level. The governor says as he did in the run-up to last Saturday’s presidential poll, he will leave no stone unturned and spare no effort in ensuring that the party’s flag-bearer in the governorship election, Mr. Sanwo-Olu and all the 40 APC candidates in the House of Assembly poll are duly elected on Saturday March 9. Unknown gunman on Wednesday shot into a crowd celebrating President Muhammadu Buhari’s re-election in Sabo, Yaba, killing one person, while a police officer was seriously injured by some protesting youths in Okokomaiko, Lagos. The News Agency of Nigeri gathered that the unidentified gunman opened fire on the celebrating crowd at Iwaya area, killing one person on the spot. Lagos police Spokesman, CSP Chike Oti, who confirmed the incidents, told NANthat the police officer was attacked by some protesting youths on the Lagos–Badagry expressway. Oti said that policemen, led by the DCO, SP Sunday Oyekanmi, were appealing to the youths as they were causing heavy traffic on the highway. He said that while the policemen were appealing to the youths to leave the road, the youths attacked them with machetes and sticks during which the DCO was seriously injured and collapsed. “The Commissioner of Police in Lagos, CP Zubairu Muazu, has warned that the command will not tolerate any attack of his men who are working to protect lives and property in Lagos,” Oti said. Oti said the 37 youths arrested for allegedly attacking the policemen at Okokomako were taken to the State CID, Panti for investigation, while detectives were on the trail of the suspect who shot dead one person in Yaba. On the alleged skirmish on Lagos Island, Oti said there was no crisis between Yoruba and Ibos traders as being spread in the social media. According to him, some areas boys were having misunderstanding amongst themselves and the police went there to stop them before it degenerates into a full-scale crisis. “The area is calm, there is patrol everywhere. Members of the public should disregard any rumour of crisis in Lagos Island,” Oti said. Presidential and National Assembly elections at Okota, Oshodi/Isolo Local Government Area of Lagos were disrupted by suspected thugs. Eye witnesses said the hoodlums came in about 10 motorcycles and forcefully dispersed voters, INEC officials and security operatives with weapons. It was gathered that elections did not hold in some polling units as a result of the incident. Witnesses said voters fled for their lives as the hoodlums unleashed mayhem on the area. Also, late arrival of Independent National Electoral Commission workers at various polling units across Oshodi Isolo and Alimosho Local Government Areas of Lagos delayed the commencement of the polls. The monitoring, which started from the Oshodi Isolo LGA Secretariat showed late departure of INEC ad hoc workers and electoral materials to different polling units. An INEC official on duty at the secretariat, who declined to reveal his identity, said some ad hoc workers did not turn up, necessitating emergency deployment of new set of workers to make up for the shortfall. In Bolade/Sopeju, Sogunle/Alasia, Ewuntun Mofoluku areas and Adebimpe Avenue, Alimosho, voting was delayed for a minimum of two hours even though there was high turnout of voters. Voters, while expressing their anger at the late commencement of the polls, claimed they got to the polling units as early as 7am. In addition to late arrival of INEC workers, there was an incidence of card reader failure at Polling Unit 035, Sogunle/Alasia Area in Oshodi and late pasting of voters’ lists in most units. The INEC ad hoc officials were seen pasting the lists in some polling units shortly before accreditation. A voter at Adebimpe Avenue, Alimosho LGA, Mr Sunday Aja, expressed disappointment at the delay in the polls, adding that he was ready to wait till they arrive. “We are eager to vote, but we have not seen INEC officials. I arrived here at 7.30am and this is 9.10am. We got information that voting was started in other places. We are ready to wait till they arrive, ” Aja said. 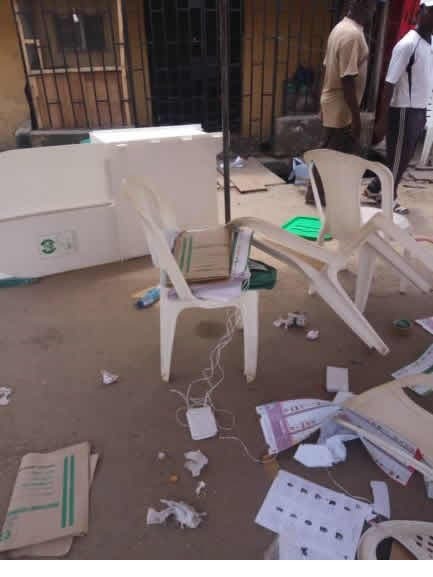 One Shimbura Isaac at Arowojobe/Olatunji Bolade-Oshodi, said INEC officials arrived the polling unit at exactly 10.45am, claiming that they were not organised. He said, “The place is not organised and no one is addressing us on why they arrived late. Also complaining about the card reader failure, Oladapo Seun at Adewunmi/Ogefon polling unit lamented that INEC officials arrived at 10.20am but the card reader refused to work. However, a new functional one was later delivered to the unit at 11.57am. Meanwhile, Senator Solomon Adeola, who represents Lagos West Senatorial district, commended INEC shortly after casting his ballot at Adebimpe Avenue Alimosho Local Government at Ward E polling Units 021, at 10.33am. 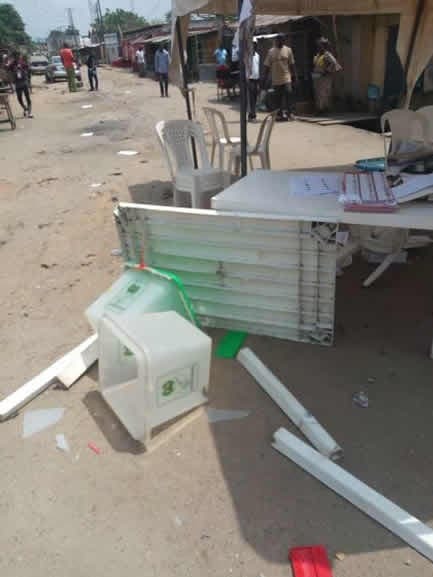 Ballot papers strewn on the ground by thugs in Okota, Lagos. This came just as the National Chairman of the APC, Mr Adams Oshiomhole, said unlike the PDP, the APC had never used the federal might to rig elections in the country. Speaking at the APC presidential mega rally which held at the Teslim Balogun Stadium in Surulere, Lagos, Tinubu said Obasanjo should be relegated to the dustbin. He drew his allusion from a reported statement accredited to the late President Umaru Yar’Adua who stated in 2007 that the election that brought him into power was flawed. The 2007 election was conducted during the administration of ex-President Obasanjo. A mammoth crowd of party supporters waited for over six hours under the sun for the presidential candidate of the APC, President Muhammadu Buhari, and his entourage. Tinubu said during the administration of Obasanjo and Atiku, major companies relocated from the country, adding that the PDP’s move to return to power is to continue the sale of the country from where they stopped. He urged the electorate to guide their Permanent Voter Cards jealously and troop out en masse to vote for the APC candidates across the board in the February 16 and March 2 elections. Tinubu said, “Who sent Michelin, Dunlop, Siemens packing out of the country, it was the PDP government. They want to come back to take our money to Europe and America. For the foreign observers, you are truly welcome, observe what you want to observe, write your report in peace and go home, this is our democracy. America is still questioning its own democracy. Prior to Buhari’s arrival, Fashola listed the ongoing construction of road projects such as the Lagos Ibadan Expressway, the 3050 Megawatts Mambilla Power Plant, among others in Lagos and other parts of the country as the achievements of the present administration. For the second year in a row, the Lagos State economy received a major, unprecedented boost in the entertainment, hospitality and creative sectors in four weeks of the yuletide season. In a press statement released over the weekend by the State’s Commissioner for Tourism, Arts and Culture, Mr. Steve Ayorinde, various reports, statistics and analyses monitored across immigration office, banks, aviation, hospitality and leisure parks; food, beverage and distribution businesses as well as event venues, shopping malls and cinema box offuce earnings captured an estimated direct spendings of over N50bn within the entertainment and tourism sector in Lagos State alone. Ayorinde said reports monitoring the prevailing December trends showed an unprecedented footfall influx of more than three million people entering Lagos in December alone with a multi-billion naira spendings in tow in hotel lodgings, local in-bound flights and taxi/chartered transportation, alcohol and beverage consumption; culinary business; visits to resorts, parks, clubs and lounges, live theatre and cinemas; concerts and clubs as well as ancillary businesses like fashion and clothing, kiddies’ games and toys, and private security guards, which are all now part of the tourism and entertainment ecosystem. “Like in 2017, last December in Lagos was hugely creatuve economy- friendly, which again affirms the state’s preeminence not just as West Africa’s commercial hub but also its entertainment nerve-centre,” Ayorinde said, adding that the beauty of this assertion is that the surge in the creative enterprise over the yuletide period was felt by all and sundry; was statistically measurable and is now a subject of discussion among analysis. According to him, the high volume of economic activity that were directly related to tourism-related visits, entertainment and leisure accounted for a significant chunk of the total value of transactions in this state of 21million residents whose estimated GDP of $136bn in 2018 is regarded as the fifth largest in Africa, after Nigeria, South Africa, Egypt and Algeria. Ayorinde said: “December has always recorded the busiest footfall in Lagos from figure obtained from immigration and aviation authorities. Aside the One Lagos Fiesta which drew an two million visitors cumulatively across its five venues over eight days from December 24 yo 31st, other big concerts like those by Davido, Burma Boy, Adekunle Gold, Rhythm Unplugged and Sound City Awards also attracted large crowd into Lagos and of course huge spending. Hotels were filled to capacity in most parts of the state and we are aware that Lagos and Calabar benefited from additional scheduled flights due to the huge attractions of Calabar Carnival, OLF and the A-list Concerts in Lagos.” He added that virtually all the entertainment sub-sectors recirded huge spendings in billions over tge yuletide period with 15 top foreign and local box office hit films released across the state hitting a record N3bn revenue in December alone; while parks, beaches and other resorts also recorded remarkable, sometimes unprecedented patronage from reports made available to the state government. The commissioner said these remarkable global recognition and last December’s good business outlook in the creative sphere were in tandem with the vision of Governor Ambode to make Lagos the creative hub in Africa and “to assure corporate institutions and investors that the state security and social infrastructure can support the ever growing entertainmdnt and creative landscape in Lagos. The US embassy in Nigeria has announced a closure of its Lagos and Abuja offices due to the ongoing government shutdown in its country. The closure will affect thousands seeking to apply for, or renew their visas, as their appointments would have to be rescheduled. In a post on its official Facebook page, the embassy said the both offices would re-open once the shutdown is resolved. “Due to the current U.S. government shutdown, the American Centers located in the Embassy, Abuja and Consulate General, Lagos are unfortunately closed,” the post read. In US politics, a government shutdown occurs when congress fails to appropriate funds for the following fiscal year. The shutdown, the third in the US this year, began on the midnight of December 21. The government had partially shut down after the White House and congress reached a deadlock on budget funding deal of five billion dollars for the construction of a wall along the US- Mexico border. Mick Mulvaney, incoming chief of staff of President Donald Trump, said the shutdown may continue till congress convenes on January 3. “It’s very possible that this shutdown will go beyond the 28th and into the new Congress,” Mulvaney had told ABC. An explosion has occurred in Abule Egba area of Lagos State as vandals broke an oil pipeline in the area, leading to spillage at Tipper Garage Bus Stop. It was gathered that unspecified number of houses and vehicles were caught in the huge explosion in the early hours of Wednesday. Human casualty figure could not be ascertained at the time of filing this report. The impact resulted in inferno as which razed several houses and cars at the incident scene. Lagos State Firemen and LRU firemen are on ground to combat the inferno in order to curtail the further spread to adjoining buildings and filling stations, according to eyewitness reports. Jimi Agbaje, governorship candidate of the Peoples Democratic Party (PDP), says he decided to take another shot at the number one position in the state because he could not find a “suitable” younger candidate for the position. Speaking on Channels Television, Agbaje said after losing the governorship election in 2015, he had made up his mind not to contest the seat but could not get a suitable candidate for the party. “Even though I didn’t want to run, I felt that we could get a candidate,” Agbaje said. The PDP candidate expressed confidence that he would be victorious at the poll. He said governance has come to a near-zero in the state, promising the people that he has come to liberate them from “pseudo-democracy”. Agbaje had been a two-time governorship candidate. He ran under the platform of the Democratic Peoples Alliance (DPA) but lost to Babatunde Fashola in 2007. In 2015 when he ran under PDP, he lost to Akinwunmi Ambode, the incumbent governor. Lagos has recorded a major global recognition for its commitment to the arts and culture as it formally joins the influential World Cities Culture Forum. According to a press release signed by the Permanent Secretary, Lagos State Ministry of Tourism Arts and Culture, Mr. Fola Adeyemi, Lagos has now joined globally respected cities like London, New York, Los Angeles, Toronto, Lisbon, Edinburgh, Seoul, Hong Kong and Tokyo which are celebrated as cultural hubs by the World Culture Cities Forum, an initiative of the Office of Mayor of London. According to the press release, the profile of Lagos State as an arts and culture hub in West Afruca is also featured for the first time in the triennial authoritative publication of the Forum – World Cities Culture Report (2018). The statement quoted the Commissioner for Tourism Arts and Culture, Mr. Steve Ayorinde, who together with the Chairman of the Board of Lagos State Council for Arts and Culture, Mrs Polly Alakija represented Lagos at the summit, of recognising the honour as a validation of the giant strides that the state has recorded in the areas of arts and creative sector in the past three years. ” The honour from World Culture Cities Forum is well deserved and a validation of the commitment that the Lagos State Government has shown to arts and cultural development; more so that it is coming on the heels of Mastercard’s 2018 Report ranking Lagos as the most visited city in Sub-sahara Africa,” the statement quoted Ayorinde as saying. “The World Cities Culture Report is the first to bring together examples from across the world on how cities are tackling the issues they face with cultural policies. The report outlines the ways in which culture drives regeneration, creates jobs, increases tourism, gives young people positive opportunities and improves health,” the statement said. • Projects in Montréal, San Francisco and Melbourne, have been developed in collaboration with, and in recognition of, indigenous populations to celebrate and fully acknowledge the cultures of First Nations. • In Lagos, previously neglected areas are being brought into government’s attention through the One Lagos Fiesta that holds simultaneously across cities and through infrastructural renewal projects that site 500-seater theatres in five areas simultaneously. The report also compiles data which paints a detailed picture of the cultural institutions and resources in each city, such as the number of public libraries, museums, art galleries, live music venues and heritage sites. Data on international visitor and student numbers, the percentage of people employed in the creative industries and the foreign-born population are also included by many cities. This data will enable cities to protect and support their existing culture, as well as helping new venues and spaces to flourish. Mr Jimi Agbaje was on Friday declared winner of the governorship primary of the Peoples Democratic Party (PDP) in Lagos State. Agbaje, who was the party’s flagbearer in the 2015 election, will be taking another shot at the Lagos Oval House, come 2019. Agbaje was declared winner of the primary after polling 1100 votes to defeat Mr Adedeji Doherty, who scored 742 votes. Announcing the results about 4.40pm, the Chairman of the Primary Electoral Committee, Senator Victor Oyofo, said that the party had demonstrated democracy in action with the successful conduct of the primary. He commended both men for the way they conducted themselves throughout the process, saying that the party was proud of them. “I, Senator Victor Kassim Oyofo, with all humility, announce the results of the PDP primary for the office of governor in Lagos State, which took place yesterday and was concluded this afternoon. “There were two contestants, Chief Olujimi Agbaje and Chief Adedeji Okuwagbemiga Doherty. “It was a keenly contested election, very fair. In my view, an example of what democracy should be. “They fought a good fight, the process was open, everyone expressed their desires and the votes have counted. “At the end of the exercise, Agbaje had a total score of 1100 votes, and the runner up, Engineer Adedeji Doherty, had a healthy 742 votes. “By the powers conferred on me by the Electoral Act and the Constitution of our party, I wish to announce and declare Mr Jimi Agbaje as winner of this contest,” he said. Oyofo congratulated Agbaje as well as his counterpart, saying he had no doubt the party was on the path to win Lagos. Agbaje, in his speech, said he accepted the victory and congratulated Doherty for giving a good fight. “Let me first of all formally accept to be the gubernatorial candidate of our party in the 2019 election. “So, I will of course congratulate specially Engineer Adedeji Doherty, for the keen contest we have just concluded. “When you are in a race, you must know you either win or lose. Deji has demonstrated the capacity to accept what has happened. Agbaje said his mission was to take Lagos to greater heights, and called for the support of all party members in pursuing the goal. Earlier, Doherty congratulated Agbaje, saying that his victory was not for him alone, but for all members of the party. He said the race to claim Lagos was worth it to bring more development to the state, promising to work with Agbaje to achieve the goal.